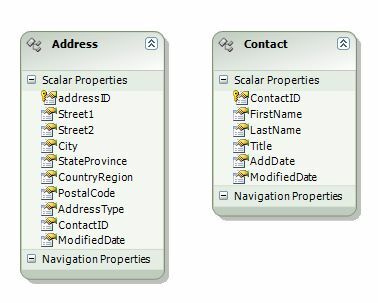 Zlatko Michailov, the Entity SQL program manager at Microsoft, writes in his blog: "A well defined query against a well defined entity data model does not need JOIN. Navigation properties in combination with nesting sub-queries should be used instead. These latter constructs represent task requirements much more closely than JOIN does. "—http://blogs.msdn.com/esql/ (November 1, 2007). To show it means, here is an example. 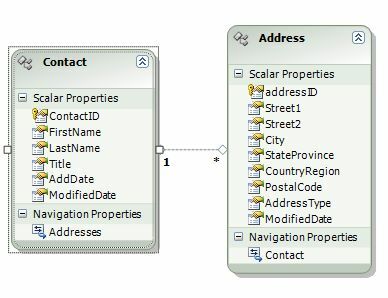 In this model the Contact is referenced by multiple Address. Here we explicitly expression their relationship by a reference object. Because we have this navigation properties, we can write the following code using this navigation properties and sub-query like below. If the navigation properties is missing(as shown in the following chart), then you have to use join.